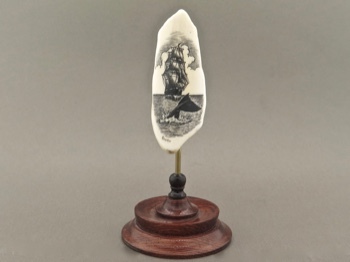 Fossil walrus ivory is very old, ranging from 300 to 3,000 years in age. 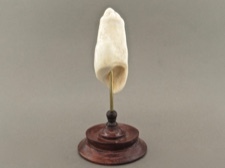 Excavated from the permafrost in August and September each year, primarily by the coastal Yupik culture, fossil walrus ivory is one of the most colorful of ivories. Each piece is unique, its color determined by the kind of minerals it has lain with in the earth. 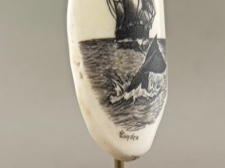 This creamy white tooth, dramatically engraved with a whaling ship and a diving whale, is 2.5 inches long and 1 inch at its widest. 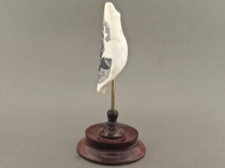 On its wooden stand it is 4 inches tall. Note: Due to the size of this item, actual shipping charges will be less than indicated on your order.